Cycling Malaysia is a great way to see the country, and yet, only a few people dare explore what lies on the backroads between Kuala Lumpur and Penang. We can guarantee that, besides well-known tourist stops like the Cameron Highlands and Ipoh, there’s much more that’s worth discovering in the states of Selangor and Perak. 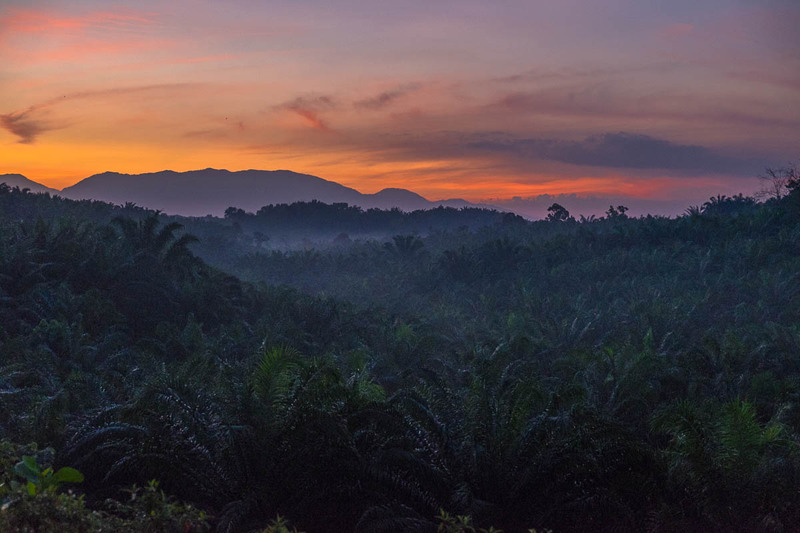 A bicycle gives you flexibility and the chance to experience Malaysia’s countryside up close. 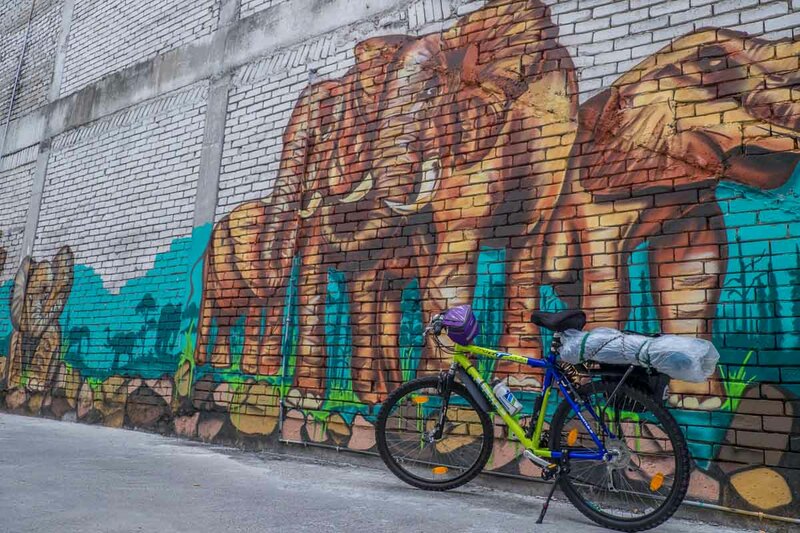 I have cycled 400km from Bangsar in Kuala Lumpur to Penang island, choosing a relatively flat coastal route, and touching on some interesting towns and places. It took me and a friend, Dinesh, a total of 6 days, including a full day off spent resting and exploring the garden town of Taiping. 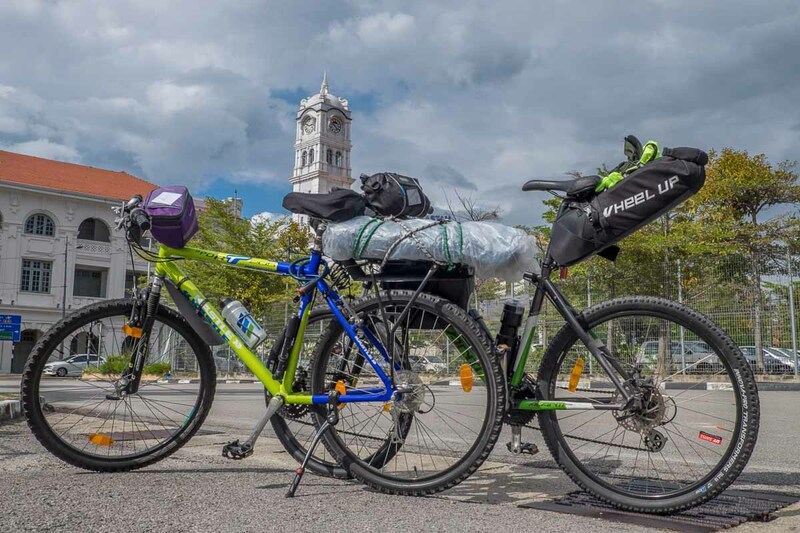 This post describes our complete itinerary, including things to see and do in all the different stops, suggestions on where to stay, and tips on how to tackle this cycling adventure in West Malaysia. On the first day, I and my friend Dinesh cycled about 70km from his home in Bangsar Baru to Kuala Selangor. The plan was to board the KTM Kommuter Train from KL Sentral to Sungai Buloh and start cycling from there, shaving off a boring — and dangerous — section inside of Kuala Lumpur city, that’s generally full of cars and not very much fun to cycle. See what you can do in KL here. Online information reported that these KTM trains indeed allow cyclists to carry their bikes (folding, mostly) on board the trains, but unfortunately, it’s not the case anymore — at least in the morning. A KTM worker told us that carrying our bikes on the train was possible, but only after 6 pm. This rule is plain useless: shouldn’t KL cyclists be able to get out of the city in the morning, cycle Selangor’s back roads, and catch a train home in the evening? Sometimes, Malaysian authorities really come up with very poorly-thought choices. It was already about 8.30am when we received the bad news from the Kommuter staff, and were urged to start cycling out of town. Dinesh figured out that the best way to cycle out of KL and head northwest would have been to cut through Petaling Jaya. You can do that by riding across the campus of Universiti Malaya (one of the best places to cycle in KL, actually), reconnect to the AH2 pedalling north via Kota Damansara and, at last, reach Sungai Buloh. It was quite a relief when we finally reached Sungai Buloh, as the road becomes less trafficked, the unending line of skyscrapers thinner, and you finally start seeing some greenery, palm trees and small houses dotting the countryside. After reaching the small town of Kuang, the road becomes the E25 for the last stretch to Kuala Selangor. 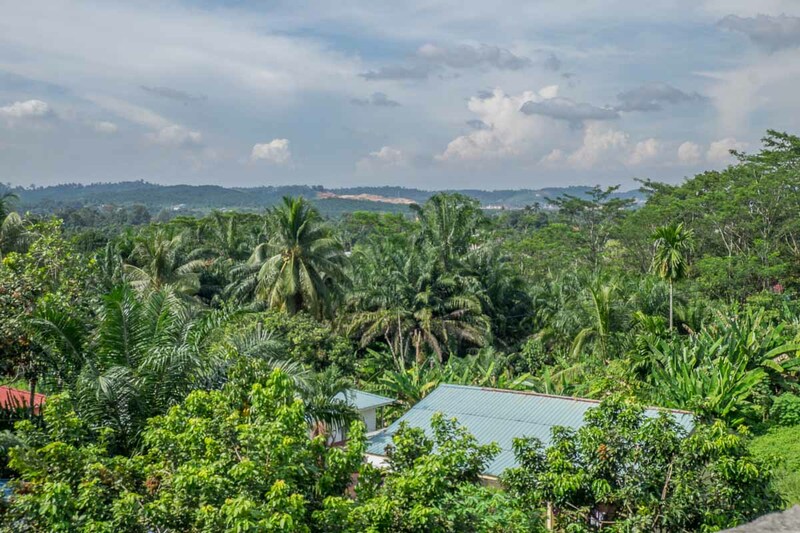 It’s a small highway, so traffic can be a bit intense, but it has quite a few calm stretches that cut across palm oil plantations. The area around Kuala Selangor has a series of interesting backroads filled with beautiful Malay houses lined on nice lawns which are much nicer to cycle than the E25. Bring an offline GPS app (our favourite is Maps.me) and find them as you go along. This was the first time I visited Kuala Selangor, and you know what? I really liked it. 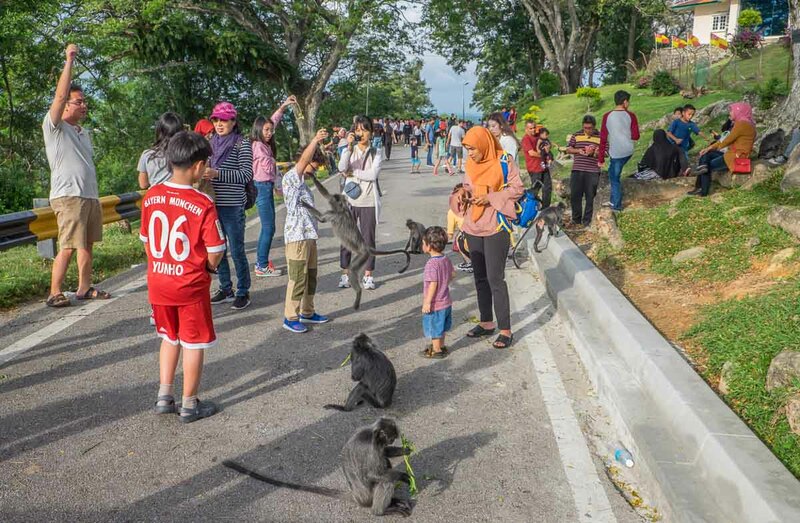 The town’s main attraction is Bukit Melawati, a hill set next to the town center, populated by many, many, cute silver leaf monkeys. It’s important to say that the monkeys here are very spoiled by the tourists who got them used to free food. For this reason, they come extremely close to humans, often climbing onto their shoulders. Kuala Selangor’s monkeys are harmless and playful and are not afraid of coming very close to you, even touch your hands asking for food. Avoid close contact if you don’t feel comfortable around them. 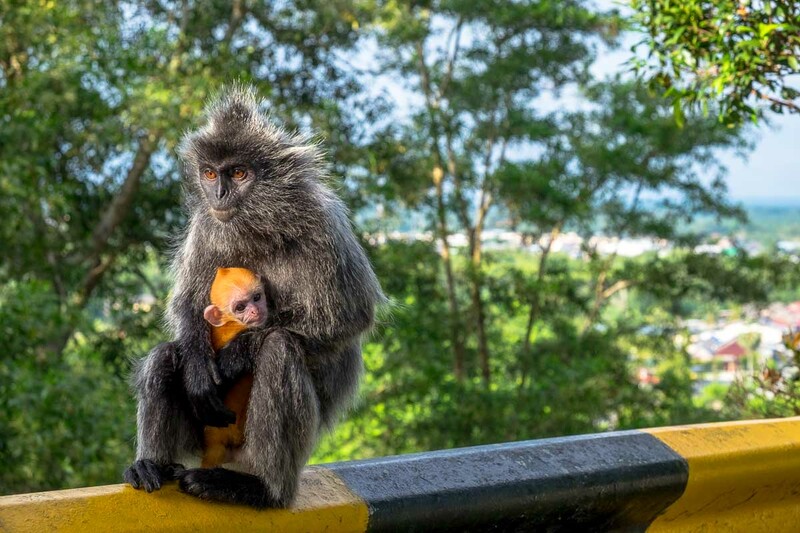 A silver leaf monkey with her golden-furred baby on top of Bukit Melawati in Kuala Selangor, our first overnight stop cycling Malaysia from Kuala Lumpur to Penang. Bukit Melawati has a train that rocks up and down the hill, but it’s best to take a walk up until the lighthouse perched on top, and soak the views that extend all the way to the nearby coast. The silver leaf monkeys of Kuala Selangor are way too used to be fed by tourists… don’t go too near them if you are uncomfortable around wildlife. 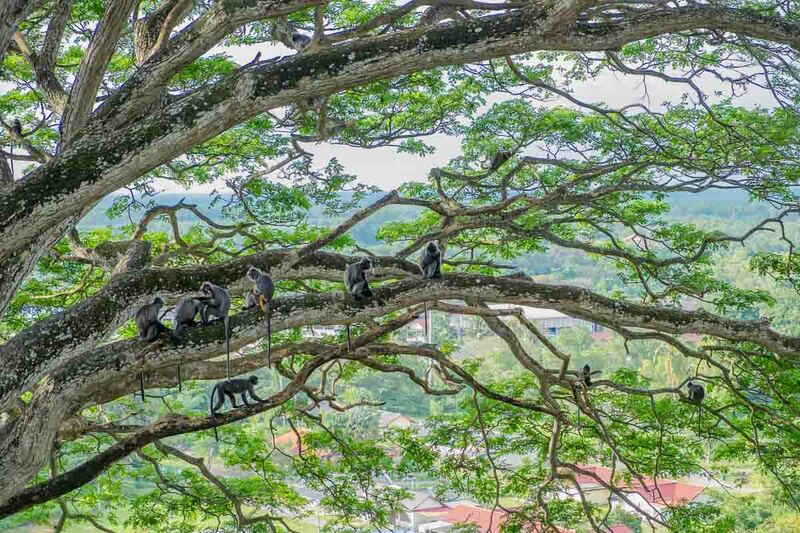 Bukit Melawati has beautiful, huge trees where the silver leaf monkeys go about their business. Not far away from Bukit Melawati, on the opposite side of the Selangor River, the riverside is filled with restaurants where you can have very good seafood. You should come here right before sunset, kick back with a drink in hand, and relax while watching the sun shed drops of pink onto the palm-fringed horizon. There are also sunset river cruises that leave from this particular spot. The next morning, since we had to return to Kuala Selangor town to cycle northwest towards Teluk Intan, we also discovered some interesting Chinese temples, not counting the wet market at Pasir Penambang, where you can have a hearty breakfast of Chinese noodles garnished with fish before continuing pedalling north. Dinesh cycling along some beautiful Malaysian back-roads between Sekinchan and Sabak. They are like cycling lanes, skirted by coconut trees and villages. Amazing riding. 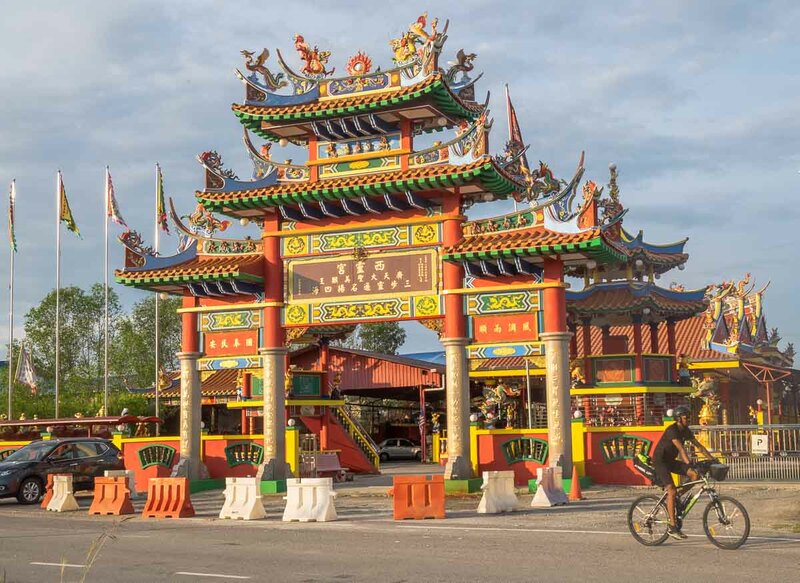 Cycling from Kuala Selangor to Teluk Intan is one of the longest stretches of this trip, and certainly a long day on the bike. However, by planning the right stops and the right route, it is also a very scenic ride, especially if you set off in the early morning to enjoy the cool breeze. 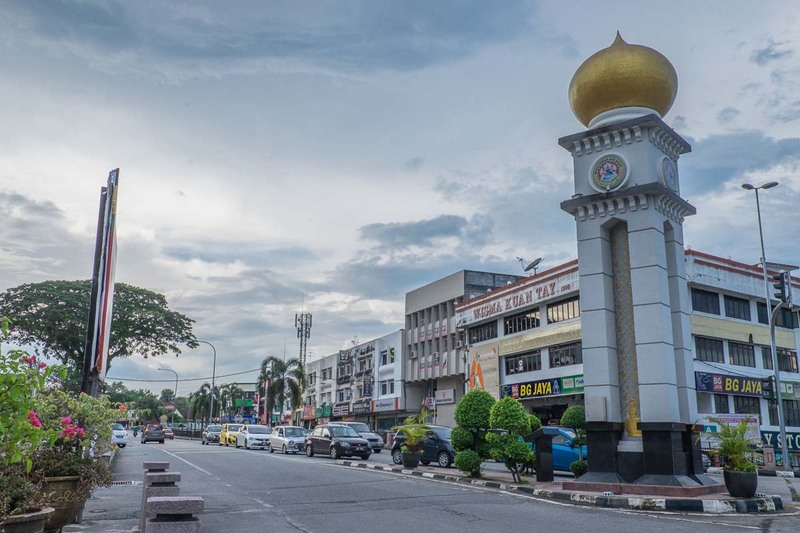 There is one main Highway 5 connecting the port city of Klang, to the southwest of Kuala Lumpur, all the way up to Teluk Intan. It also passes by Kuala Selangor, and it’s the main road you’ll have to follow all day. But fear not, because there is a very quiet and scenic web of tiny backroads that skirt Malay kampungs nestled between the coast and bushes of vegetation and coconut trees. You can reach these backroads by staying west of Highway 5: start steering that way from the Pasir Penambang area in Kuala Selangor. Once you reach Kampung Pasir Panjang, all you have to do is take one of the smaller side roads jutting west of Highway 5, and proceed towards the sea. 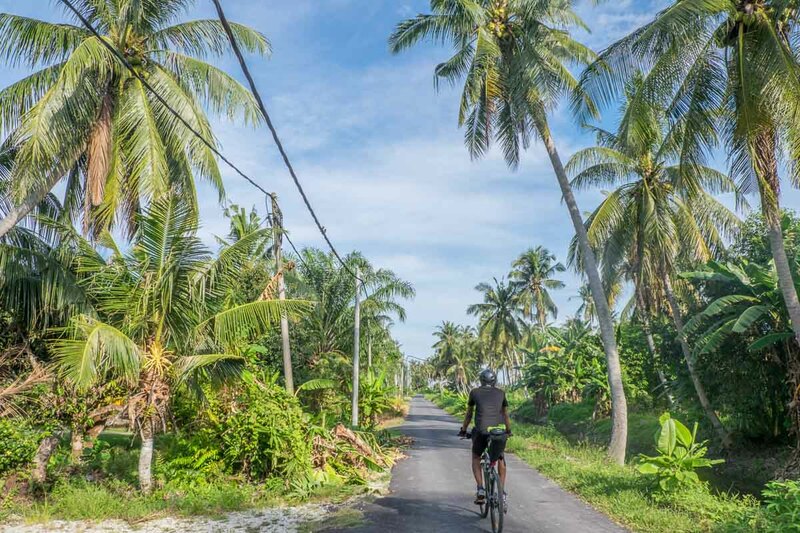 Keep pedalling past Tanjung Karang and onto famous Sekinchan, which makes for a good breakfast stop, and can be reached in less than 2 hours from Kuala Selangor. We left quite early in the morning at about 7.15 am and reached Sekinchan by 9.30 am, including stops at the Chinese Temple and spending some time on the GPS figuring out the best way to avoid Highway 5. Sekinchan has plenty of food options and many hotels, but we don’t recommend you stay here because, regardless of the hype and the nice paddy fields around the town, we didn’t feel it was a “must stop” and carried on to Sungai Besar, where we arrived at about 12 pm, hot and tired, and made a long lunch and rest stop. As the mid-day Malaysian heat was punishing, we waited well up to 3 pm before setting off again, this time necessarily following Highway 5, via the towns of Sabak, Hutan Melintang, and finally, to Teluk Intan, where we arrived at about 6 pm. In January 2019, the section of Highway 5 from Sungai Besar to Sabak and Hutan Melintang was full of construction sites, which may be a good or a bad thing depending on when you cycle. As we went on a Sunday, the road was pretty much free of workers, and we could simply cycle to the left side of the construction site’s plastic barrages, on good tarmac, and sheltered from the traffic. This is also one of the hilliest stretches of the ride, as Highway 5 crosses several rivers, and you’ll have to climb up and down a series of bridges. 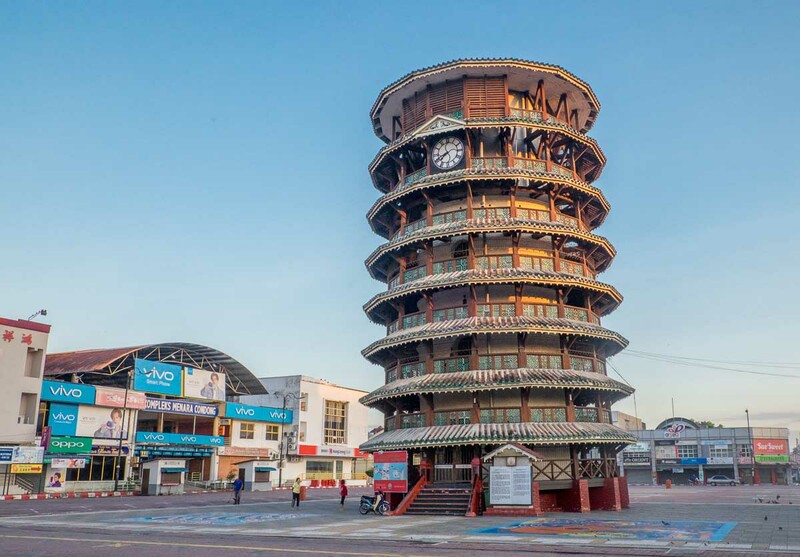 The absolute must-see in Teluk Intan is the town center with its Menara Condong, or Asia’s only leaning tower. Shaped like a Chinese multi-level pagoda, it was used as a storage tank for water to prevent draught. It is visibly slanting, exactly like the Pisa Tower, and makes for a very unique site in Malaysia — and the whole of Asia indeed. It houses a small exhibition of pictures and opens daily from 8 am to 6 pm. You can climb, free of charge, for views over the confluence of the Perak and Bidor rivers where the town center nestles — after all, remember that “Teluk Intan” means “Cape of Diamonds”, a name given to describe the strategic position of this town. The old town in itself is pleasant to stroll and has plenty of interesting food options — including peculiar local dishes, such as the chee cheong fun garnished with ground beef. This stretch of road between Teluk Intan and Batu Gajah just re-confirmed how Perak state is one of Malaysia’s most beautiful. Today’s goal was to keep off the main highway to Ipoh as much as possible, cycling on the back roads and exploring some offbeat territory. Mind well that if you look this option up in Google Maps, it won’t show the connecting road to and from Chenderong Balai. But we can guarantee that there are roads, which are all extremely well-paved, even if they pass through some pretty remote (and super scenic) countryside. Maps.me has this route so you better stick to using that app over GMaps. We left Teluk Intan at about 9 am, after a hearty breakfast and a climb up the leaning tower. The main road north from town is the 109. We followed it for a few kilometers until the junction to Kampong Gajah — don’t proceed along this road and stay instead on the A16, following it towards Chenderong Balai. It’s a large, well-paved road with nice views of the Cameron Highlands massif on your right, dominating over the plains and pushing the clouds up in the sky. Chenderong Balai is nothing much than a few Malay homes set on the two sides of a road junction: this is where you should proceed northwest, following the road as it snakes through plantations and other small villages, on the way to Ayer Kuning. Don’t follow it all the way through, and make sure that, after about an hour cycling, you look at the road signs and turn left towards Tanjung Tualang. You’ll know you are on the right way when you’ll turn left and immediately bump into a very beautiful lake surrounded by lotus flowers. It’s a very good place to make a pit stop, rest, and drink some water before pushing on to continue today’s ride. The road undulates between palm oil estates and paddy fields populated by buffaloes and egrets. After meandering through the greenery and touching another couple of smaller lakes, this side road rejoins with the A15 at Sungai Galah, about 5km short of Tanjung Tualang. That’s where you can stop for lunch: Tanjung Tualang is a very nice little village, famous for its fresh prawns and main cluster of old shophouses and coffee shops. People come here all the way from Kuala Lumpur to try the prized prawns, but there are also many other cheaper restaurants and coffee shops where you can while away the hottest hours of the day. We set off again around 3 pm, after having consumed healthy doses of Kopi O and The O Limau Ais. Elephant-inspired street art in Batu Gajah’s town center. In fact, the town’s name is “Elephant Rock” in English. From Tanjung Tualang is only about 18km to Batu Gajah, or about an hour cycling on a straight and perfectly paved road. On this same road A15 you’ll pass the Tin Dredge Number 5, Malaysia’s last remaining bastion of Perak’s mining past. It’s quite an impressive sight, although kind of overpriced at RM10/RM20 for locals/foreigners. Yeah, we believe that two-tiering price is so third world, but what to do? Once you will arrive at Batu Gajah’s compact town center, you’ll find several options to eat and rest, but not much to do in terms of sites — unless you arrive in town early enough and have time to go to nearby Kellie’s Castle — a manor built by colonial planter Jim Kellie, that’s supposed to be haunted. Start this day early as you’ll go through the most scenic part of this trip, and you’ll want to have plenty of time to make some stops at the small towns you’ll encounter along the way. From Batu Gajah, take the A108 and exit town to the west towards Siputeh, where the FT5 and Road 73 connect at a big four-way junction — watch out for heavy traffic. 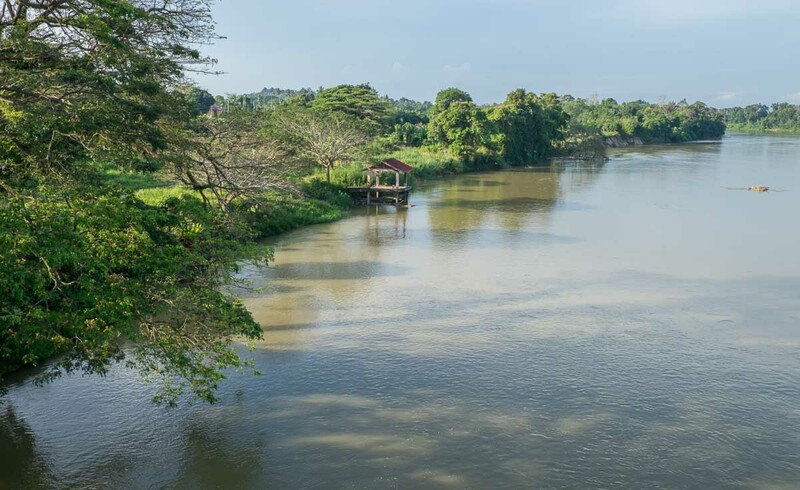 You need to proceed along Road 73 as it gently cuts its way through Perak’s deepest countryside, meeting and crossing the Perak River at Parit. 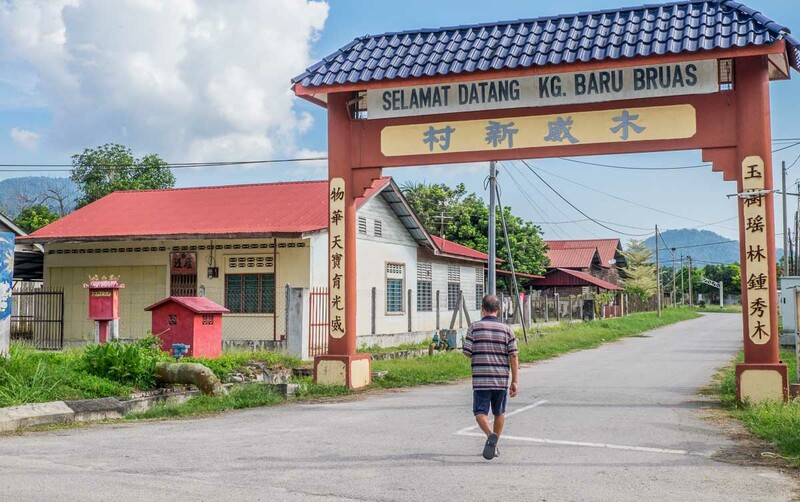 Parit is a lovely one horse town dominated by a domed clock-tower and is a perfect pit stop for a hearty breakfast of freshly homemade nasi lemak. Restoran Yee Lok just opposite the clocktower is great and cheap for breakfast. Like a throwback to colonial Malaya, in Parit you’ll see Malays and Chinese working together, joining forces to feed all of the country’s races. A very warming sight in today’s racially-sensitive Malaysia. From Parit, the road continues following the Perak River for a couple of kilometers, then it crosses it over, and snakes through another 20km of plantations and forest to the town of Beruas. This is another good, sizeable stop for coffee and food. Note that, to the right just before you enter into Beruas town proper, is a gated village with a Chinese arch. That’s a kampung baru, or a remain of the enclosed Chinese villages that the British built all over Perak during the Malayan Emergency. These places prevented local Chinese from sending food and aid to the communist insurgents hidden in the surrounding jungle. A fascinating history of Malaya, indeed. After Beruas, the road turns north via Sungai Rotan and then the small town of Terong. After that, you’ll hit Changkat Jering, where this countryside road meets the main entrance to the North-South Expressway, and also the Federal Highway 1. 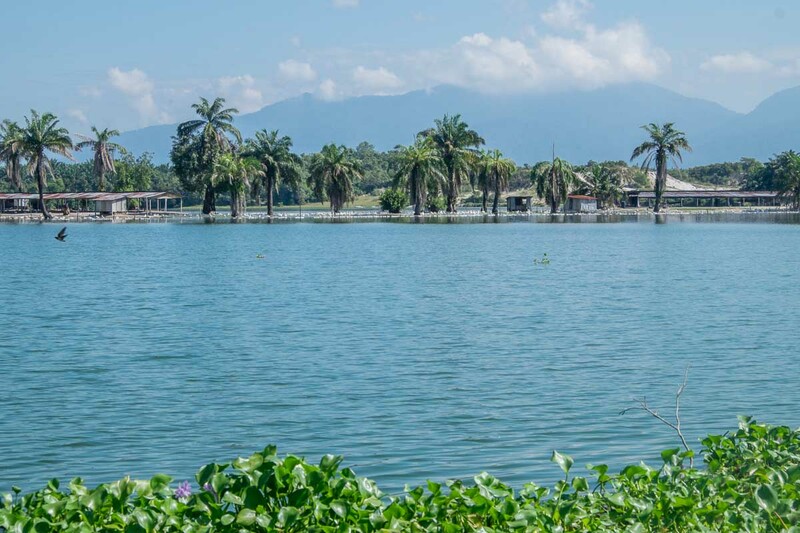 Just continue pedalling north, and you’ll make your triumphal entry into Taiping — a lovely small city where you should consider making a rest stop on the following day, as there’s so much to see, eat and do here. 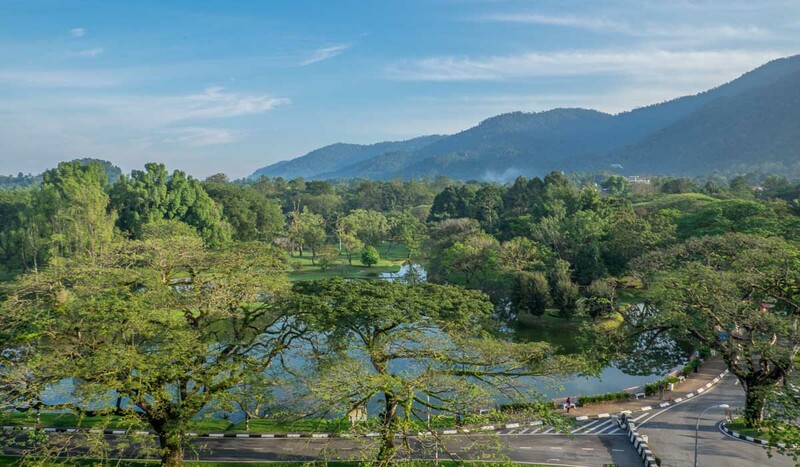 Taiping’s beauty and prime attraction is Maxwell Hill, which gives the town its peculiar backdrop of misty, green mountains. You can hike all the way up (about 4hrs) or take a jeep up and walk down, or wait for a return trip by jeep. At current, the jeeps depart to the summit at 8.30 am, 10.30 am, 12.30 am and 2.30pm. The last jeep down the summit of Maxwell Hill leaves at 3 pm. 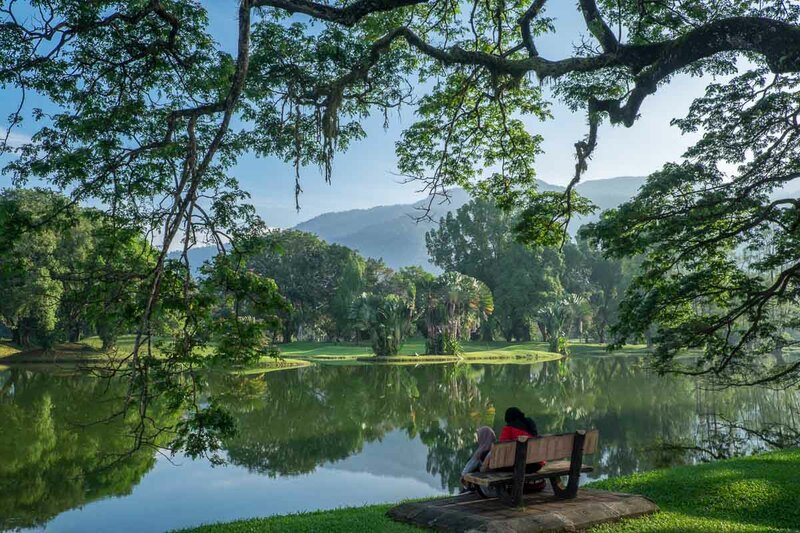 Taiping Lake Gardens are a popular spot for locals. You’ll see fewer tourists here, especially during the week. At the bottom of the hill is the Lake Gardens, a very interesting place to stroll, with old, huge trees set at the side of many beautiful ponds. Locals use the circular road surrounding the gardens as a jogging and cycling track, but there’s enough space to comfortably walk around. 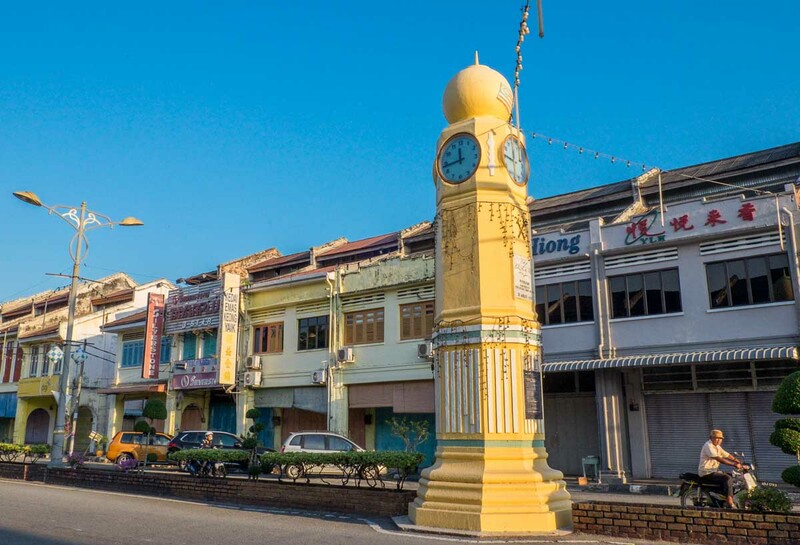 Taiping Old Town itself is a little jewel of roads, markets and peoples that make Penang and its hipster development blush: we believe there’s more authenticity in Taiping than in all of George Town combined. 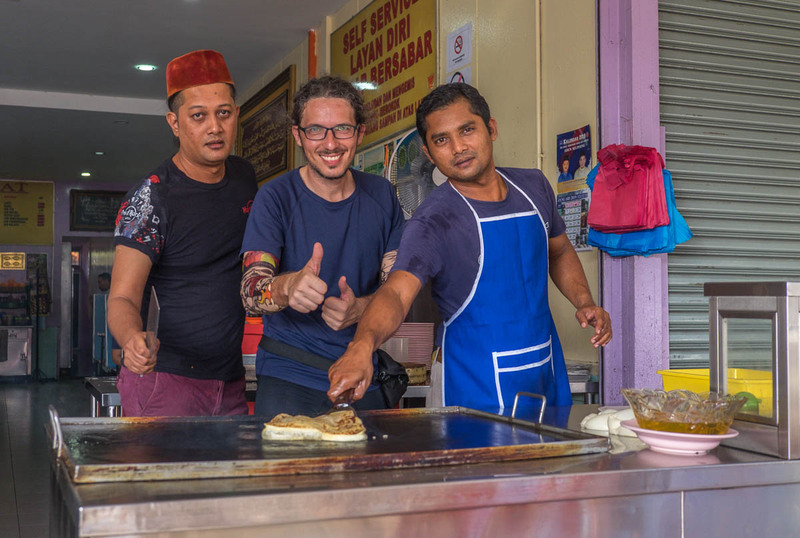 Browse the streets, have some food, talk to the friendly locals (very less English is spoken here, it’s time to get cracking at Malay). You’ll definitely have plenty to do on your rest day… and it’s about time you rest those sore muscles. Thus far we tried our best to stay off the main, more trafficked roads. But on the last stretch from Taiping to Penang, the most direct route is the Federal Highway 1 to Butterworth — where you are forced to proceed to Penang Island using the Rapid Penang Ferry, at a cost of 1.20RM including bicycle fees. Remember: cycling on both Penang Bridges is forbidden and if caught, you’ll get a heavy fine. Federal Highway 1, however, is not as bad as we initially thought: the first stretch from Taiping/Kamunting to Bagan Serai passes through quiet countryside. 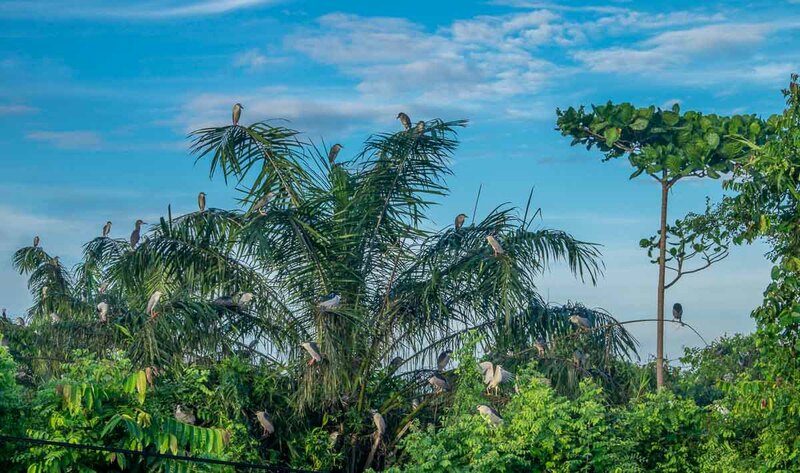 As we cycled in the early morning, we saw a very beautiful sunrise and ended up cycling very, very close to a patch of trees upon which dozens of birds were resting in the morning light. It was one of the most intense natural encounters we had throughout the whole trip. 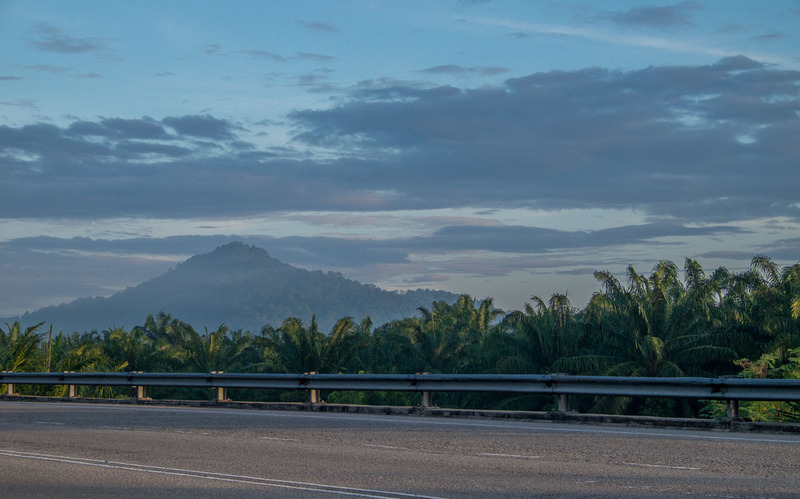 The Highway continues northwest to Parit Buntar, a couple hours into your ride —and a good breakfast and coffee stop, given the many roti canai restaurants available here — and the sister town of Nibong Tebal, famous for its firefly-spotting tours. There’s no reason to linger much longer though, for you have another 40km to Butterworth. The next major sizeable town is pretty Bukit Mertajam, where there are more eating options than you really need. The last 15km to Butterworth follow the most trafficked part of the road, as it links all the smaller towns to the industrial area of Seberang Perai. Cycle all the way until you’ll reach the bridge connecting to Penang Sentral, Butterworth’s new bus terminal, which sits directly next to the Butterworth KTM Kommuter Train Station, and the Rapid Penang Ferry Terminal. Ferries to George Town run approximately every 20 minutes and will bring you to the Rapid Penang Jetty Terminal, in 3 minutes walking distance from Chulia Street and George Town’s main cluster of accommodation. There are way too many things to do in Penang for any length of time you’d like to spend on the island. Don’t forget that Penang food is some of the best in Malaysia. As you’d really need a dedicated itinerary to explore Penang and all its history and sights, you may check this 2 days in George Town itinerary and, if you have more time, start by learning what to do in Penang in 3 days. The last thing to say is… congratulations for having completed an amazing 400km cycling trip between Kuala Lumpur and Penang! We told you, it was easier than it seemed.